The automated approach of an unmanned Russian Progress supply ship to the International Space Station was aborted today when telemetry between the spacecraft and the Russian command module was lost during final approach. The Progress 38 cargo ship flew safely past the lab complex and the station's six-member crew was not in any apparent danger. But Russian flight controllers were unable to immediately resolve the problem. Amid ongoing troubleshooting, the Russians plan to carry out two Progress rocket firings overnight Friday and one on Saturday, setting up a second docking attempt around 12:17 p.m. EDT Sunday. But that assumes engineers identify and resolve the problem that derailed Friday's docking or mission managers get comfortable with making a second try in the absence of a firm fix. away after an aborted docking attempt. The preferred option, a NASA official said, is to attempt another automated approach using the Russian KURS navigation system that malfunctioned Friday. If that doesn't work, engineers could attempt to maneuver the Progress close enough to the space station for commander Alexander Skvortsov to take over manual control using a different system. For the manual TORU system to work properly, however, the Progress must be within about six-tenths of a mile of the station. It never got that close during Friday's approach. Progress 38, loaded with 1,918 pounds of propellant, 110 pounds of oxygen, 220 pounds of water and 2,667 pounds of experiment equipment, spare parts and other supplies, was launched Wednesday from the Baikonur Cosmodrome in Kazakhstan. The spacecraft was in the final stages of an automated approach to the Zvezda command module's aft port Friday when the KURS communications gear in the station lost lock on the approaching Progress. Docking had been targeted for 12:58 p.m., but instead the Progress flew past the International Space Station and pulled ahead. "It's rotating slowly," Skvortsov radioed at one point. "We see the vehicle and it keeps sliding behind and moving toward the front part of the station." 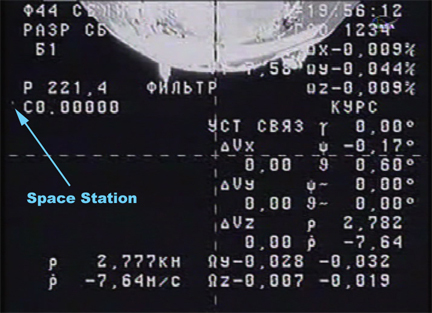 "OK, copy," a Russian flight controller replied. "It's moving slowly and I think the range is increasing," Skvortsov said. A few moments later, he reported: "It's drifting away from us, it's rotating and also it's moving away from us. We are moving with service module forward and it's moving in the same direction but it's going farther and farther away from us." About an hour after the problem cropped up, Russian managers told the crew to stand down for the day. "We are not going to do the docking today," Russian flight controllers called up shortly after 1:30 p.m. "All activities for the Progress have been deleted for right now. When you are going to have your lunch, please be available for communication if we need to call you." NASA mission control commentator Rob Navias said engineers did not immediately understand what might have gone wrong. "They're in the process of evaluating what may have caused a loss of telemetry between the Progress 38 cargo ship and the Zvezda service module about 30 minutes or so before its expected docking," he said. "That exchange of data between the radio beacons on the active side of the system, which is the Progress, and the passive side of the system, which is the Zvezda in this case, provides the distance between the two vehicles and the rate of closure between the approaching vehicle and the docking target so the computers can be updated on the Progress itself for its final approach for a linkup at a rate of about one tenth of a meter per second. "In this case, that telemetry link was lost for unexplained reasons," Navias said. "The Progress aborted its automated rendezvous and flew a safe distance past the International Space Station and now is maintaining an opening rate." The last confirmed distance call indicated the Progress was nearly four miles ahead of the station and Navias said "the crew was never in any danger."